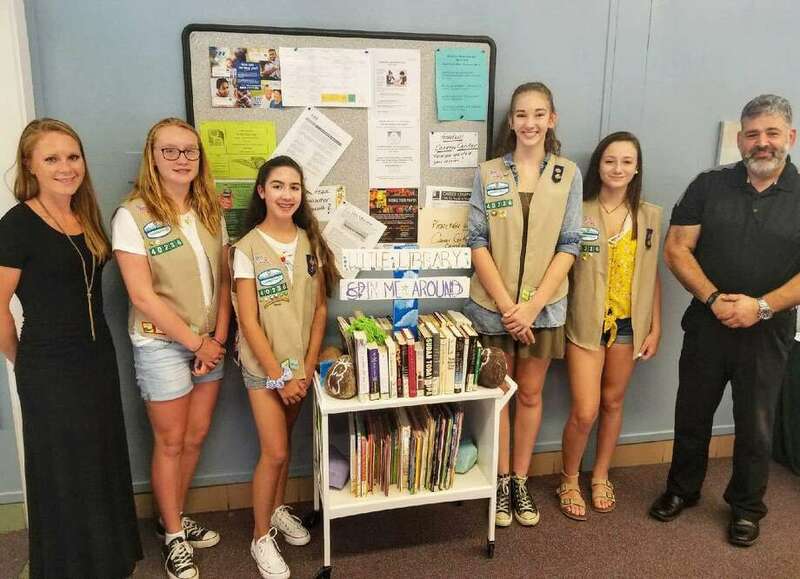 Members of New Milford Girl Scout Troop 40326 recently unveiled a Little Free Library at Social Services at the John Pettibone Community Center in town. The project, which consisted of repurposing an old library cart, is the Scouts’ Silver Award. Little Free Library book exchanges are becoming more popular, providing a long-lasting, sustainable way to offer books to children, families and neighbors to ensure everyone has access to books year-round, especially those individuals who might have difficulty accessing public libraries. Sarah Geary of Social Services received the gift from the girls, Anna Burns, Caralyn Anderson, Samantha McCaughan and Madisyn Avallone, as Mayor Pete Bass joined in the festivities.